In order to objectively compare the performance of different adhesives, I decided to perform side-by-side torture tests. I cut out some strips 2 cm (3/4") wide from 6mm (1/4") Sintra®, glued up test samples, and pull-tested them to failure. This quick diagram shows the basic geometry I used (the horizontal piece in the diagram is fastened firmly to a table during testing). It gives me an easy test setup (requiring less force than for an in-line pull). It provides some insight into the fracture mechanics of the material. It makes for a more challenging adhesive test, as some adhesives adhere well to just the core material, or just the face sheets. Most of your Sintra® joints are likely to be edge-to-face joints in 'bot construction. Note that I cut my test pieces on a table saw; since this yields very smooth and square edges, my results may differ from yours (but more on this later). 6 minute epoxy -- a bit of a disappointment, the joint suffers an adhesive failure with 600 g (21 oz) load. 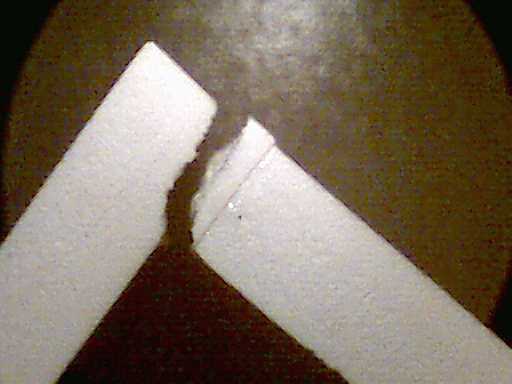 The failure leaves a clean break at the face sheet side of the joint (i.e., between the epoxy and the side of the vertical member in the image above). I've heard a number of good reviews of using Epoxy with Sintra®. I have to assume that there may be a strong dependence on glue brand and type, as I've had consistently, repeatably, bad results with it. PVC pipe cement (Oatey clear)-- here the joint fails just inside the core at 1200 g load (42 oz). A thin layer bit of core is pulled loose and left adhered to the face sheet side of the joint. While probably good enough for a small BEAMbot, this result was also a bit disappointing, since I was expecting PVC pipe cement to do very well with PVC sheet. High-strength epoxy -- about 4 times stronger than the fast-setting stuff, this takes 24 hours to cure but failed at 2.3 kg (5lb) load. The joint failure was entirely within the dried epoxy. Vinyl adhesive ("One-drop Vinyl Glue") -- made for patching vinyl toys, it was a so-so performer on Sintra. A bit of solvent welding took place, with the joint failing just inside the core at 2.3 kg (5 lb) load. Devcon "Plastic WelderTM" -- a 2-part adhesive, looks like epoxy, mixes like epoxy, sold next to epoxies, but maybe not an epoxy per se. If nothing else, this should win an award for the smelliest glue around (use this stuff only with serious ventilation). This also did a bit of solvent welding, with the joint failing just inside the core at 5 kg (11 lb) load. Gel cyanoacrylate1 ("super glue," "krazy glue") -- a fairly good performer, the joint failed primarily in the dried adhesive, but tore some core material out as well, at 5.5 kg (12 lb) load. Thin cyanoacrylate1 ("super glue," "krazy glue") -- the champion to date, and a real surprise to me in that the joint is consistently stronger than the surrounding material. When tested to failure, material near the joint fails at approx. 12,000 g (yep, 12 kg -- 25 pounds). Note that the break starts right at the edge of the joint (this is the site of maximum stress in my test setup), and propagates through core material roughly parallel to the joint. It's not very visible in this image, but the break precisely follows the edge of some adhesive "slop" on the edge of the material closest to the camera. All this confirms what I was expecting from the material -- the majority of its strength comes from the face sheets; the core has very little tensile strength on its own. I tried a number of adhesives that didn't work at all -- so poorly, in fact, that the joint could be broken with gentle fingertip pressure. Glue for plastic (styrene) models -- no real surprise here, since PVC is nothing at all like styrene chemically. Oatey's "X-15" glue for PVC sheet -- this glue's poor performance really surprised me, since the test involves working with PVC sheet, after all. This joint was incredibly flexible, and gave little resistance to any applied force. I think used chewing gum would have done better than this stuff. Your first choice should be some sort of cyanoacrylate -- thick or thin, depending on the situation. Thick is a bit easier to handle (so it doesn't run all over the place), and is best for joints where there are small gaps to be filled. Thin is a bit trickier to handle, but gives the very best strength, presuming no gap filling must be done. If you choose not to use a cyanoacrylate, a good high-strength epoxy is likely your best alternative. It's easy to find, and reasonably strong. Note that higher strength epoxies require longer curing times, so be prepared to be patient if you go this route. Also note that you have to mix up epoxy as you use it, so you'll need to plan ahead a bit to avoid either running out or wasting large amounts of your epoxy. While you can see you've got good adhesive choices, sometimes you just need to put things together in a reversible way -- here, you'll need to use fasteners, which are the subject of the next page. 1. Confusing the issue here is the fact that "Super Glue" is both the name of a company, as well as the brand name of their particular blends of cyanoacrylate adhesives. In fact, the Super Glue Corp. made the two cyanoacrylates I tested, as well as both the high-strength and 6 minute epoxies. Meanwhile, "super glue" has become sort of a generic slang for cyanoacrylate glues in general (likely due to the fact that "Super GlueTM" was one of the first such adhesives to market). For the sake of clarity, I use the terms "cyanoacrylate" or "CA" to denote such adhesives for the purposes of this writeup.